Go east, young man, go east: Scania’s market reach grows with a key workboat contract. The reasons why are easy enough to see. When Scania announced its recent deal with Potomac Riverboat Company, part of the Entertainment Cruises family, to deliver eight, EPA Tier 3, 500 HP DI 13-liter engines in 2017 to power its high-speed, low-wake water taxis in Washington, DC, it marked the beginning of what is so far a good year for the San Antonio-based engine manufacturer. The 88-foot vessels will carry 149 passengers and will be built by Louisiana-based Metal Shark, to specifications from BMT Designers and Planners. As for Scania’s market penetration, Alcalá explained, “East Coast sales – we’ve had others but in the passenger vessel market, we’ve had a lot more success on the West Coast. What’s important to us is this is new construction, not repowers. We love doing repowers but we’ve been trying to show off our ability to support the builders, the naval architects and the operators. We’ve had good success with our distributors and setting up dealers.” As it turns out, that’s exactly what tipped the scales for Scania on their latest sale. Scania’s marine engine platform today includes a complete range of 9-, 13- and 16-liter benchmark engines for both propulsion and auxiliary applications. From propelling fast patrol craft to pushing heavy river barges upstream, there is a likely a Scania marine solution for any workboat application. 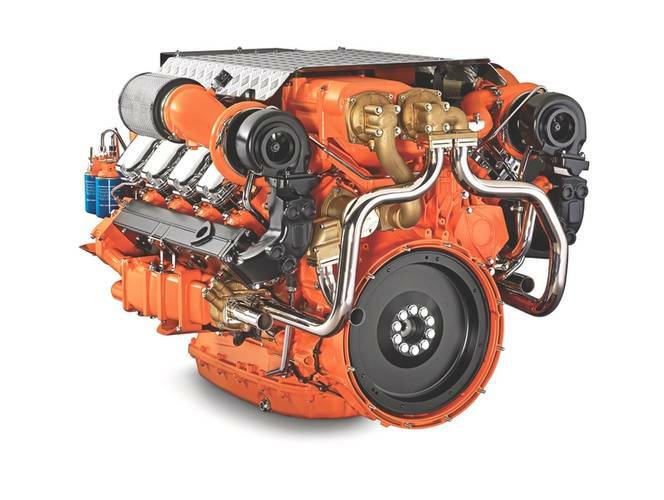 Scania engines are available in EPA tier 3 ratings up to 900 hp, and the firm has also launched a range of IMO tier 3 engines for Canada. Looking closer, that reliability stems from a simple design philosophy, one which employs a modular block design that – even over the breadth of three sizes – employs as much as 30 percent in parts commonality. And, because so many parts are common to each engine, that means Scania rarely is out of stock on any part, when the customers come knocking. Alcalá reported that a recent internal ‘parts availability’ survey revealed that more than 98 percent of their parts were always in stock. In a business where time is money and down time drains the bottom line, that’s a key metric. The modular commonality comes into play in other ways, as well. Because the Scania line is so similar, mechanics who are qualified to work on one engine will find that they can provide service to all; the 9-, 13- and 16-liter versions. And with the “one hole for each head” design, each with just three bolts per valve cover, mechanics changing out one liner don’t have to pull the entire head; an enormous time savings for operators. Any engine OEM will tell you that the fewer times the head has to be pulled and human hands inserted into the equation, the less chance there is for mechanical problems down the line. Saving weight is the obvious way to reduce fuel consumption and increase performance of any planing vessel. Thanks to the superior power-to-weight ratio and compact dimensions of the Scania marine engines, boat designers have great opportunities to optimize operational efficiency and profitability. Alcalá adds, “Comparing us to our competitors in the 13 liter range, for example, our engine is a lot lighter for the same horsepower so just by definition, that’s more power to weight.” For operators, this advantage – several hundred pounds – translates into more passengers and/or cargo per voyage and/or the ability to carry a larger fuel load which in turn allows for greater endurance. In the passenger vessel sector, and taking into account the Coast Guard’s new and heftier passenger weight assumptions, this metric is especially important. Scania today manufactures a wide range of truck, bus, marine and industrial engines. A true propulsion pioneer, the company employs approximately 42,000 employees with an annual turnover of $11 billion. Last year, it celebrated its 125th year in the business. 2017, says Alcalá, “has so far been a great year for Scania. It certainly has started out well.” With a powerful, lightweight and fuel efficient line-up of modular marine engines, that’s a good place to be. Already strong in at least two sectors and on the West Coast in general, the firm is looking to accomplish more. When they do, the compass is pointed east.